Now that its politics have been sanitized, its nationalism muzzled, and any hint of radicalism or provocation scrupulously effaced, Call Of Duty is almost quaint. It wasn’t always so. It was seven years and as many installments ago that Call Of Duty 4: Modern Warfare arrived and, in a flourish of keyed-up maximalism, reinvigorated a series whose appeal had been thoroughly exhausted. Modern Warfare was polemical—its form courted debate. It was louder and faster and more visceral, but it wasn’t strictly violence or brutality that caused alarm. What distinguished Modern Warfare, chiefly, was both its most alluring and repugnant feature: It apprehended the aesthetics of contemporary war. It was the rare first-person shooter to understand that over the previous decade-plus conflict had receded from the front lines to become discrete and remote. The distance between fiction and reality that keeps Call Of Duty diversionary rather than disturbing has been brazenly, even irresponsibly collapsed in the past. In the summer of 2007, just a few months before the release of Modern Warfare, two Apache helicopters killed at least a dozen people in New Baghdad. Compare the widely circulated video of this incident—released by Wikileaks in 2010—to Modern Warfare’s thermal imaging display for airborne artillery attacks. They are indistinguishable. I find this sort of thing abhorrent, but productively so. This is likewise true of the equally notorious Zakhaev Airport massacre (“No Russian”) from Modern Warfare 2: It’s valuable precisely because it is objectionable. However obvious and inflammatory, these provocations at least pose moral questions—some facile, others faintly serious. But it would appear that Call Of Duty has lost its appetite for controversy, or perhaps its courage to arouse it. Advanced Warfare, the series’ latest iteration, takes as its subject and milieu the battlegrounds of the near future, from the neon glow of a skyscraper-laden Seoul to the rain-damp dystopian streets of a still-ruinous Detroit. Call Of Duty has drifted far from its reflection of a real-world nightmare. We’re now safely in a dream: A Day-Glo fantasy of invulnerable supermen and their oversized guns. There remains not the dimmest trace of reality in it. The year is 2054—not that it matters. Where Modern Warfare divided your attentions among a host of characters, Advanced Warfare commits you to one: Private Jack Mitchell, of the United States Marine Corps, whose exploits will soon span the globe. After an unsuccessful skirmish with the North Koreans leaves your best friend dead and your left arm severed, a “private military contractor” by the name of Jonathan Irons (voiced and face-acted by Kevin Spacey, who here looks like a model made of Plasticine) offers you a position with his highly advanced Atlas Corporation and, to sweeten the deal, a replacement limb. You agree, and soon enough you are embroiled in a battle for no less than total control of the world. It’s hardly a spoiler to reveal that Irons, with his ominous swagger, is not quite the upstanding moral character he claims to be. Players can sense the game feebly mustering something like a point here: That the power struggles of the future will be fought among corporations rather than nations, perhaps, or that corruption and greed of the kind that seizes Irons transcends borders. But for all Spacey’s bluster, he proves a rather dismal supervillain, too easily accommodated by a narrative desperate for a simplistic moral division. He is a bad guy, and you—the valiant but unassuming American soldier who wants nothing more than to sustain world peace on behalf of the United States—are a good guy, and that’s that. That (as in all games of this sort) you are single-handedly responsible for the annihilation of many hundreds of people is the source of no ambiguity. They are bad guys too. Simply line them in your sights and get on with it. There isn’t much room for contemplation in a game that features mechanized exoskeletons—you’ll be too busy zooming around with your suit’s built-in quasi-jetpack to care. In terms of how it plays, this is the same old Call Of Duty, only furnished with a few novel toys: an impenetrable riot shield that instantly materializes from within your arm; a rocket-assisted strafing tool that facilitates swift dodges in any direction. These elements make the traditional Call Of Duty framework appealingly eccentric, even wacky. You can still run and gun in the familiar manner, but you can do it faster, higher, stranger. Locomotion has been electrified: There are submersible Jet Skis and hovering tanks; Tron-like bikes and miniature duck-and-weave choppers. Players careen up and around high-rises, whooshing between buildings with a wrist-borne zip line. At times it feels less like a wartime shooter than first-person Spider-Man. And then, too, there is the multiplayer. This remains Call Of Duty 4: Modern Warfare’s most enduring contribution to the development of the online first-person shooter: The steady morphine drip of perks and kill-streaks that reimagined virtual combat as a form of addiction. 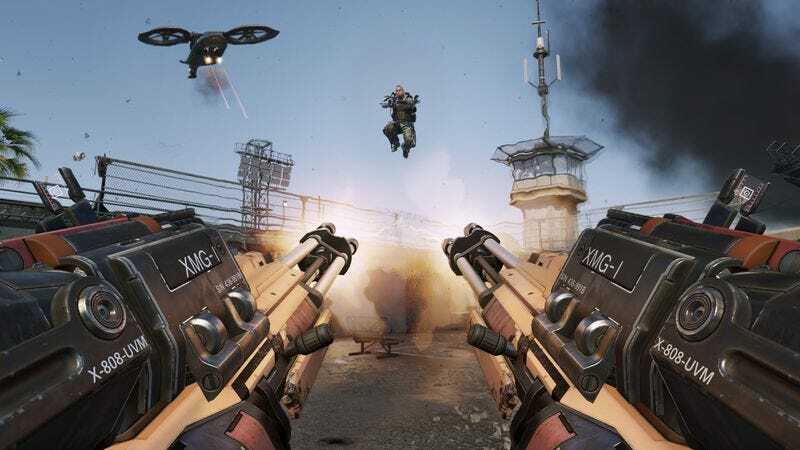 Call Of Duty’s particular class of competitive multiplayer, with its almost tactile emphasis on velocity and precision, feels at times more like a sport than a game, and it affords the gifted player similar satisfactions. Anyone seeking that thrill will be pleased to learn that it hasn’t changed. The evolution of a video game series proceeds, broadly speaking, in increments: the addition of an absent feature one year, the shrewd excision of a redundancy the next. It is a process of refinement. Advanced Warfare boasts the combined improvements of seven prior attempts, plus a handful of its own. Chief among these is a sense of verticality. Bullets, in Modern Warfare and its sequels, whiz through the air with what Nicholson Baker called “a zing and then a flump.” This time around you whiz through the air with them. Behold the double jump. It’s a testament to how static the core of Call Of Duty’s multiplayer has remained for nearly a decade that such a seemingly negligible modification could so enliven the action. I confess that over the years my interest in this once-irresistible exercise had depleted. The inspired lunacy of the double jump replenished it. This sort of ridiculousness proves a good fit with Call Of Duty’s metamorphosis. The removal of any meaningful ideology—however toxic it was when present—has diminished Call Of Duty to the level of pure fancy. It is, in other words, free to be silly. Its images no longer bear the weight of real-world baggage, no longer brush up against an uncomfortable truth. It seems apparent that contemporary warfare is developing along abstract lines—highly sophisticated drone warfare, not foot soldiers clomping around. (There are drones in Advanced Warfare, but they buzz around in bee-like waves, shooting ineffectually. Again, very quaint.) Advanced Warfare’s single-player campaign concludes just as you’d expect: in a confrontation between Irons and your indomitable hero. You track him down to his heavily guarded headquarters and battle him in a final display of old-fashioned gusto. In real-world terms, this is anything but advanced. It’s practically antique.